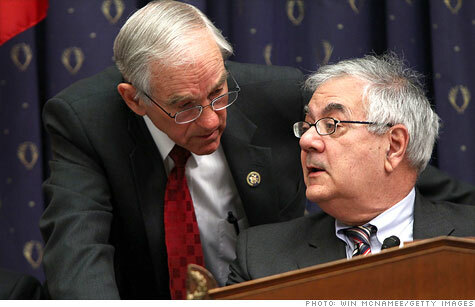 Ron Paul and Barney Frank are teaming up. NEW YORK (CNNMoney) -- Republican presidential candidate Ron Paul and outspoken Massachusetts Democrat Barney Frank want to get the federal government out of the marijuana regulation business. States should make their own rules concerning the leafy green stuff, and regulate it themselves, the pair propose in legislation that will be introduced Thursday. The bill would allow the Feds to continue enforcing cross-border or inter-state smuggling, but states would set their own laws, and people could grow and sell marijuana in places that choose to make it legal. The bill is, of course, a longshot. But making it a law isn't the whole point, according to Morgan Fox, communications manager at the Marijuana Policy Project. "A bill like this is going to get talked about quite a bit," Fox said. "I think it will spark a strong debate in the media, and we hope to get some [House] floor time for it." The bill is co-sponsored by Democratic Reps. John Conyers of Michigan, Steve Cohen of Tennessee, Jared Polis of Colorado and Barbara Lee of California. The bill's introduction comes 40 years after the United States began its "war on drugs" and just a few days after former President Jimmy Carter wrote an op-ed in the New York Times titled "Call Off the Global Drug War." In the op-ed, Carter laments a shift from what he calls the more balanced drug policies 1970s toward "futile efforts to control drug imports from foreign countries." "Drug policies here are more punitive and counterproductive than in other democracies, and have brought about an explosion in prison populations," Carter wrote. Meanwhile, Ron Paul's status as a declared candidate for the presidency is likely to bring attention to the bill. Frank's office confirmed to CNNMoney the bill will be introduced Thursday. Where are all the marijuana millionaires?